A bucket list item that you have dreamed about. Embarking upon this journey means that you will complete a full 25-mile shoreline stretch of the Lost Coast. Whether you hope to see a variety of wildlife, such as Elephant Seals, or sit and watch the stars from the bluffs, this is the trip for you. A true adventure trip because nobody knows more secret spots than our guides do. Day One: Arrive at first pick up location at 9:00 am. Arrive at second pick up location at 11:30 am. Stop for lunch at 12:30 pm. Reach first destination for a short hike around 4:00 pm. Camp at A- W-Way campground with dinner and an introduction to the trip with your guides. Day Two: Depart campground for the Trailhead. Embark upon adventure and camp at Cooskie Creek for the night. 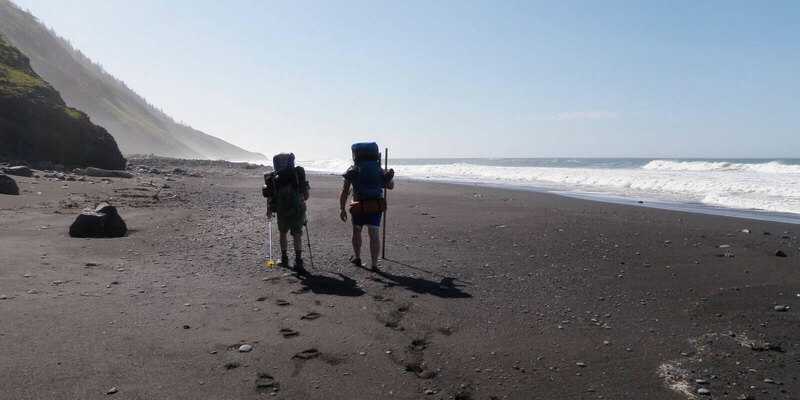 Day Five: On our final day we will pack up, enjoy a hearty breakfast and backpack to Black Sands Beach Trailhead, debrief and depart. Lunch at 11:00 am in Shelter Cove. Drive back to the pickup locations for drop off. What a fantastic Day Hike we had on Mother's day. Very professional guides. We met at Black Sands Beach, Shelter Cove. We were shuttled up to the trailhead after receiving Mother's Day Flowers. We did the six-mile hike down the ridge to the beach. The guides had great energy and really knew their stuff about the wildlife, plants and trees and the history of the King Range. When we arrived at the beach we were served a hearty lunch. We watched the whales as they breached the surface of the water, their entire body flying out of the water. What an incredible experience. A true adventure... Can't wait for the overnight hike! !